Note: We are making this thread for FreeMarks, if you have questions or concerns please contact FreeMarks directly. Worldfree’s primary aim is to build a free and more effective business network using an advanced and stable asset-backed cryptocurrency, in a virtual world accessed through natural language (normally-spoken language, initially English, but later multi-language). The company’s origin as a software developer with commercial software systems sold to many G200 companies for searching and delivering direct answers to questions from live, unstructured text is a value when brought to the cryptocurrency field. Yet, there are other pressing problems with the blockchain technology that preclude its use as a vehicle for introducing Worldfree’s proprietary natural language reasoning technology. 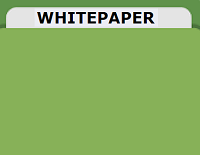 Chiefly, the blockchain is not a scalable technology, and the consensus method of decisionmaking often touted as an advantage, is in fact a disadvantage, as this White Paper discusses. There are better, more just, rational and equitable methods for decision making. The cryptocurrencies themselves suffer from economically poor design in general. First among uses of currencies is as a medium of exchange. But as a consequence of their success, and early-stage design, today’s currencies are massively deflationary, if not generally unstable. As they rise in price (as if successful equities), their purchasing power likewise increases. This is seemingly good for owners, and encourages holding cryptocurrencies, but not spending them. The crypto-economic world is thus stifled. Just as modern central bankers make great efforts to avoid deflationary environments because they stunt economies, a cryptocurrency must be designed to be a more functional alternative than fiat currencies, so that daily use for buying and selling other items is encouraged as a practical alternative currency for normal business needs. The secure FreeMark is a medium of exchange engineered to preserve the purchasing power of your wealth. Unlike other currencies, it is backed by real assets. As the money supply grows, you earn royalties for owning the FreeMark. 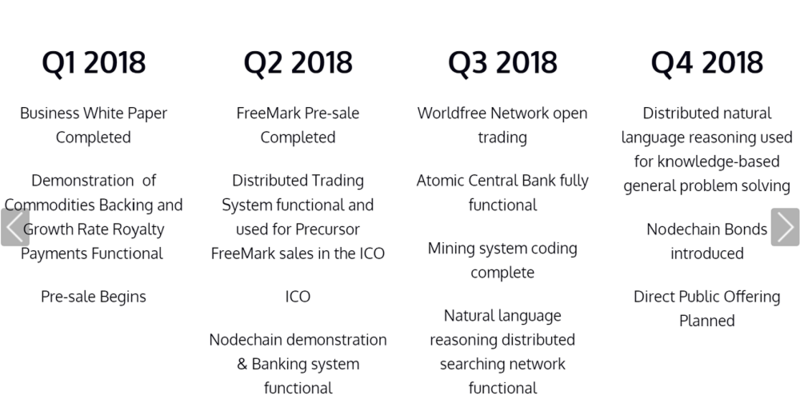 Worldfree’s FreeMark is a new cryptocurrency to be introduced in 2018 that will eventually have 100% backing, automatically pegged by the Atomic Central Bank ® to a basket of 20 commodities. It can be immediately converted into most other currencies or used to purchase goods and services on the Worldfree Network. Holding it should deliver an increase in ownership on an average balance, correlated to the positive growth of the money supply. Thus it works contrary to normal fiat currencies, where increases in money supply reduce value; with the FreeMark they receive more of them at the same value. Existing cryptocurrencies are often unstable over short periods, massively inflationary or deflationary. Necessary for a sound and expansive crypto-economy, a stable currency, pegged to a basket of 20 commodities (to the 12-month moving average) eliminates the volatility of government and crypto fiat currencies. The FreeMark is built upon a better model of transactions than just the blockchain. The Nodechain uses "ownership" as the basis of its data structure, while immutable blockchains store transactions independently and privately for each owner, keeping their data off public networks, even though it is encrypted. The FreeMark is not a fiat currency. Government or Cryptofiat currencies like Bitcoin have no intrinsic value. It and other stable coins have taken the worst aspect of government currencies and copied it in the digital world. There are no physical or productive assets backing them, unlike the FreeMark, where 65% of revenues from sales go into an audited, regulated fund. To be adopted by mainstream users, a crypto currency must give them an incentive to switch. The patent-pending Growth Rate Royalty automatically pays owners greater returns the earlier they buy. These returns are paid in FreeMarks based upon your average monthly balance. During the first year, the royalty rate is 7.5% times the growth rate of the FreeMark money supply (not 7.5% interest). Because growth rates are higher in the beginning, earlier owners are paid more. Worldfree also introduces Nodechain technology, which is different than a blockchain because it does not store transactions system-wide. It operates in a massively parallel architecture, and data file sizes per node are anticipated at less than 1Mb, with a 50X redundancy factor, irrespective of the network’s size. Transactions on the Nodechain network can be processed predominantly on the participating parties’ systems, with an effectively randomly-selected node updating the coin ownership, accessed through a function of a hash pointer. The patent-pending Nodechain still fulfils the design requirements to eliminate double spending, with greater security and better privacy, overcomes the limitations of the consensus paradigm, and processes transactions in seconds for each participant, irrespective of network size. 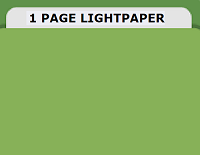 It is distributed with redundancy, using extent-based parallel access. 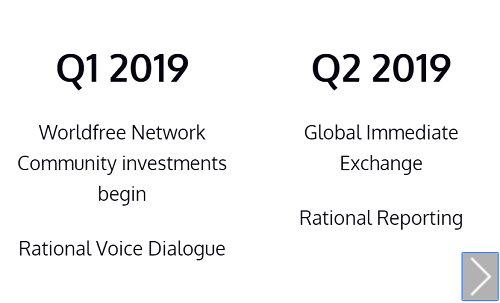 The Worldfree Network utilizes a cryptocurrency foundation engineered for prime-time and mass adoption, with a better designed economic and technological foundation. Worldfree has a global team with great experience in developing world-class application and network software and delivering it to G500 clients, as well as a group of experienced business advisors who have been invaluable in structuring and presenting our project, as well as providing future guidance. Worldfree’s team has designed and developed innovative new software products that were then sold, installed, enhanced and maintained for some of the world’s leading companies. To do this implies being the best in a particular marketplace. Worldfree’s management has thus already demonstrate that capacity, and now offers an entirely new, leading technology in the cryptocurrency space. 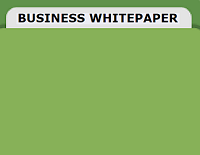 This technological leadership is important for any person who owns FreeMarks. Worldfree management’s long history in the software field is the basis for a solid understanding of future directions, investor motivations and market forces—facilitating better judgement and generally helping to make higher quality decisions for long-term capital allocation and planning. The biographies of the team members are presented below and on the LinkedIn links. The graph below shows the projected growth of asset backing from the pre-sale through 2021, when we plan to attain 100% asset-backing, all while paying out royalties and developing the technologies that will make the FreeMark the world’s most widely used cryptocurrency. Again, this full asset-backing occurs by prudent investing of the FreeMark Reserve Endowment, along with earning transaction fees and other fees, for instance those the Atomic Central Bank earns for lowinterest loans. In addition, the graph below shows how funds that are earned from the sale of FreeMarks will be apportioned to the various interested parties, as well as the distribution of tokens from the ICO sale. We are seeking to sell $fm6 million in the pre-Sale, and $fm25 million in the initial ICO. These allocations are approximate. PwC will be auditing both the pre-sale and the ICO, so that funds are allocated and managed according to the above standards. Join us to help make this new vision of a more robust and scalable digital currency platform a reality by learning about how these three amazing new technologies combine to fulfil the potential of the new world of cryptocurrencies.